One of the easiest ways to avoid having to buy new things is to look after and maintain the things you already have. You'd think that would be a statement of the obvious, but in the current throw-away consumer culture, people seem unwilling to consider making simple repairs to extend the life of an item. 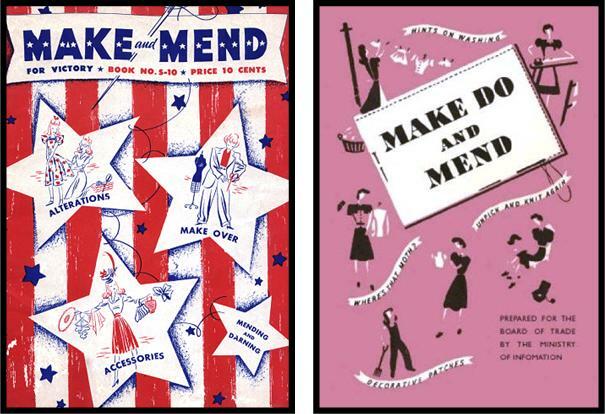 The "Make-do and Mend" slogan arose during World War II, where all kinds of resources were being redirected to the war effort and civilians had to learn to make-do with strictly rationed items of clothing, food, and other items. 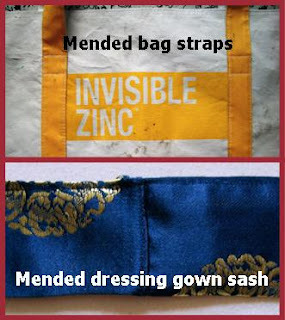 An interesting post on Make-do and Mend and rationing can be found over at the Coletterie blog here. Some Make-do and Mend media from WWII, though I would recommend getting your bloke to take off his pants first before attempting to mend them. There were a couple of notable books on how to make-do and mend, both in the UK and in the USA. Make And Mend For Victory was from the USA and published in 1942. The lovely Susannah from Cargo Cult Craft has put this on her website as a two part downloadable pdf. 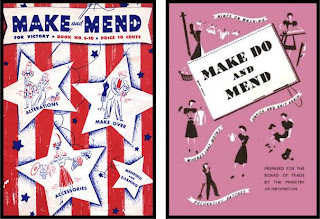 Make Do And Mend was from the UK and published around the same time. Reproduction copies can be bought from Amazon and similar places. This weekend I decided to tackle my mending pile, which contained a couple of socks with holes, a pair of knickers with an unravelled side seam, a pair of pj bottoms with a rip, a dressing gown sash that had come apart, and a carry bag where the handles had almost pulled off. I was fortunate in growing up with a mother who sewed and often mended our clothes and household furnishings. I found out that not everyone had this experience growing up when I discovered that most people have no idea what a "sock mushroom" is. So let's start with my socks. 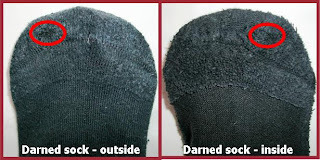 What I grew up calling a "sock mushroom", is more accurately called a "darning mushroom". It's a mushroom shaped item that you use to stretch the rounded toe or heel of a sock over so you can darn it. My mum had a plastic one where the "stem" could be unscrewed and you could store needles and pins inside. I'm more low tech and use a light bulb. It does the job quite adequately. I'm not going to go into detail on how to darn socks. There are a variety of tutorials on eHow.com. 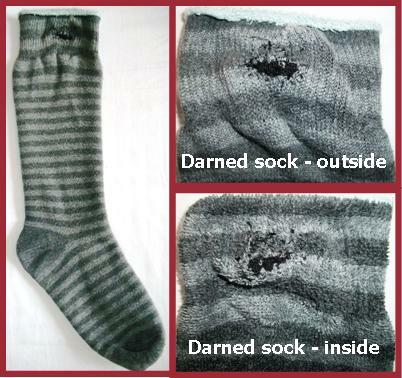 Basically it involves sewing some base threads and weaving a patch over the offending hole in the sock. It really doesn't take long to do once you get the hang of it. It's something I often do in front of the TV in the ad breaks. The grey pair I did with black thread so you can see the darned patch more easily. When darned with matching colour thread, it really isn't very noticeable, as you can see in the black pair, where I've circles the darned patch so you can actually find it! The other items in my mending pile I repaired using the wonders of modern technology - the sewing machine and the overlocker (or "serger" if you're American). The overlocker is great for sewing up seams and finishing edges at the same time. I fixed the side seam of my knickers in about 5 seconds flat. The pajama bottoms had torn where the fabric was getting a bit worn and thin. I'd previously stitched it up with the overlocker, but it had torn along the stitching line. So this time I decided to do a more stable repair and use a tight zig-zag stitch over the tear. 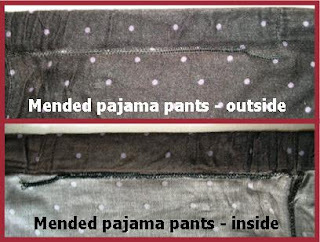 It means the repair is more visible, but these are just pajamas so I'm not concerned about that. The carry bag was a straight forward fix. It was a freebie with another purchase and a really good sized bag for carry larger items. Unfortunately, my partner had taken to using it to carry heavy tools and it had been picked up by only one handle, which caused it to rip away from the body of the bag. The repair simply involved finding some matching thread and resewing the handle back on along the original stitch lines. To prevent future repairs, I added some reinforcement stitching at the top. The dressing gown sash was a slightly more fiddly repair. It had mostly come undone at the join, but the fabric had also frayed. So the seam was completely unpicked, the frayed edges trimmed and joined with the overlocker, then flipped inside out and top-stitched in matching thread to close the seam. On the whole, maybe an hours work on a Sunday to clear my mending pile and get six items back in use and avoid having to buy replacements. Next time you go to throw something out, think about whether it could be repaired and put back into service. It will save another item going to landfill and save your hip pocket from shelling out for a replacement.